Last updated 20 Feb 2006. 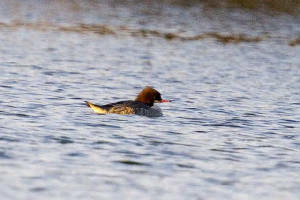 KNOCKADERRY RESERVOIR: Red-necked Grebe, 45 Wigeon, 25 Teal, 24 Tufted Duck, 24 Pochard & an Otter. KILMEADEN POOLS: 3 Shoveler (male & 2 females), 2 Green Sandpipers. DUNGARVAN: 2 Mediterranean Gulls (1st- & 2nd-winter). KILMEADEN POOLS: Green Sandpiper & Water Pipit. 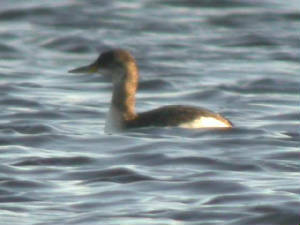 KNOCKADERRY RESERVOIR: Red-necked Grebe & 2 Whooper Swans. COOLFIN/DERRIGAL: Pink-footed Goose & 272 Greylag Geese at Derrigal cross-roads; Green Sandpiper & Chiffchaff at Coolfin; 75 Wigeon along River Suir. 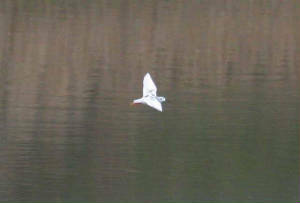 FIDDOWN/TIBBERAGHNY: Little Egret & 39 Whooper Swans (on Kilkenny side), Stock Dove. 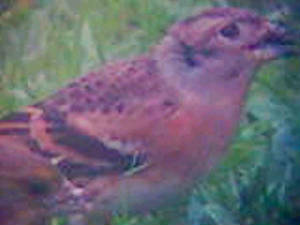 LISSELAN (nr Tramore): 3 Yellowhammers. LISMORE area: 10 Yellowhammers nr Lismore, 17 Crossbills between Lismore & the Vee. PICKARDSTOWN (Tramore road): Wing-tagged Red Kite - also seen 9 & 12 Jan 2006. DUNGARVAN: 2 or 3 Chiffchaffs & a Whimbrel at Knockanpower Lower (Ring); also a Whimbrel at Ballynacourty. HELVICK HEAD: Small numbers of dolphins & Porpoise. CAMPHIRE BRIDGE (R. Blackwater): Green Sandpiper. LITTLE ISLAND (I-WeBS count): Totals included a Little Egret, 59 Wigeon, 1163 Lapwing, a Jack Snipe, 86 Redshank, a Greenshank & 2 Turnstone. 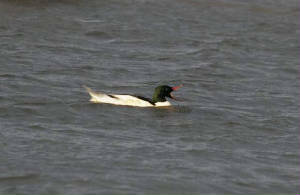 DUNGARVAN: Male Goosander at Ballyneety. 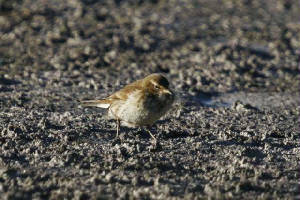 KILMEADEN POOLS: Water Pipit still present, also a Water Rail & Choughs heard. 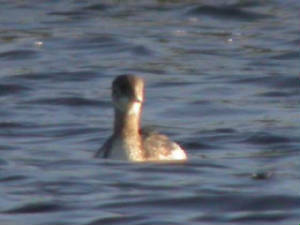 KNOCKADERRY RESERVOIR: Red-necked Grebe still present. BALLYDWAN: 2 Common Scoters & male Black Redstart. CLONEA STRAND: 6 Great Northern & 69 Red-throated Divers - also more Red-throats than usual at other sites east to Bunmahon. DUNGARVAN: Mediterranean Gull (with a green colour-ring) at Ballyneety. 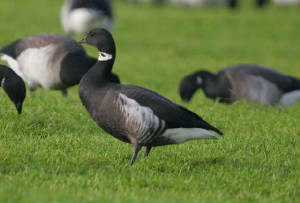 DUNGARVAN: Adult Black Brant & adult dark-bellied Brent Goose at the CBS football pitch. BLACKWATER & BRIDE RIVERS: Total count of 557 Whooper Swans (mainly Co Waterford). 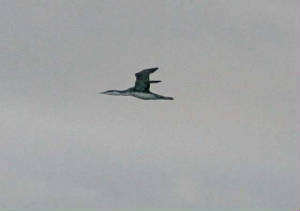 Nr TRAMORE BACKSTRAND: Report of a Spoonbill seen in flight - can anyone provide further details? 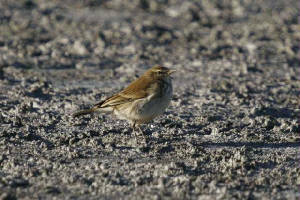 KILMEADEN POOLS: 2 (possibly 3) Water Pipits (the first since last winter's birds) & 2 Green Sandpipers. DERRIGAL/COOLFIN: Pink-footed Goose & 180 Greylag Geese (one with white neck-band 'NBX') at Derrigal Cross; Green Sandpiper & Kingfisher at Clodiagh Bridge. DUNGARVAN: In Ballyneety area, 2 Tree Sparrows & 5+ Bramblings at the dump, male Goosander & an eastern-race Jackdaw (1st county record) opposite the Park Hotel. VEE GAP: Male Hen Harrier. 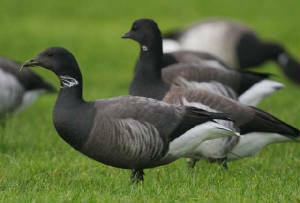 DUNGARVAN: Black Brant on pitch & putt course near the sports centre; Tree Sparrow & 4 Bramblings in stubble field near the old dump at Ballyneety. CLONEA STRAND: Purple Sandpiper, Black Redstart & Chiffchaff at Ballinclamper. BUNMAHON: Long-tailed Duck & 15 Common Scoters. Nr THE VEE: 5 or 6 Crossbills; also 4 or 5 Jays & 2 Red Squirrels between there & Lismore. 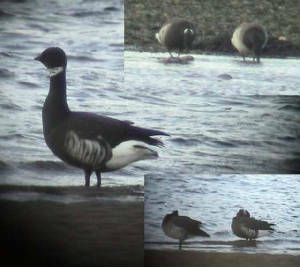 WOODSTOWN STRAND: 10 Brent Geese, 4 Great Crested Grebes, 2 Little Egrets, 2 Knot & 5 Sanderling. BLACKWATER CALLOWS: Male Hen Harrier between Lismore & Cappoquin, Little Egret west of Ballyduff. DUNGARVAN (I-WeBS count): Black Brant (off the Youghal road), 972 pale-bellied Brent Geese; female Goosander, Curlew Sandpiper & 2nd-winter Mediterranean Gull at Ballyneety. 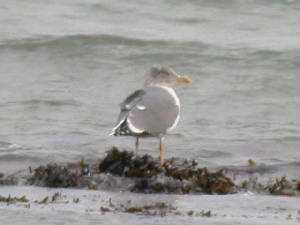 CLONEA STRAND: 36 Ringed Plover, 10 Sanderling Purple Sandpiper & 2nd-winter Mediterranean Gull. KNOCKADERRY RESERVOIR: 10 Little Grebes, 28 Tufted Duck, 4 Pochard, 2 Goldeneye, 46 Wigeon & 30 Teal. KILMEADEN POOLS: 2 Water Rails & 24 Moorhen. BROWNSTOWN HEAD: 2 Redwings, 2 male Blackcaps & 10 Redpolls. 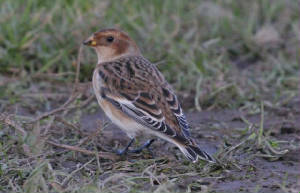 LISMORE area: 54 Whooper Swans, Dipper, many Jays & 2 Yellowhammers. BALLYDUFF: 10 Whooper Swans, 4 Green Sandpipers, 2 Chiffchaffs. BOGGAGH, nr the Vee: Male Hen Harrier. 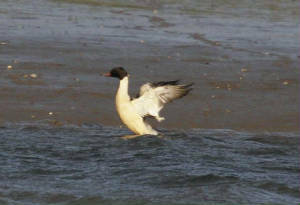 DUNGARVAN: Female Goosander & 1st-winter Mediterranean Gull at Ballyneety. 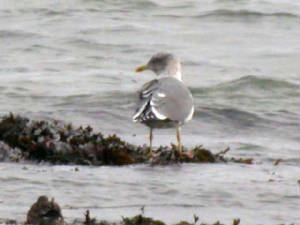 BALLINARD (Ballynacourty Pt): Adult Yellow-legged Gull, female Brambling. BALLYVOONEY COVE: Single Great Northern & Red-throated Diver; large auks (Razorbill & Guillemot) passing E at c.2700 per hr (670 E 1550-1605 hrs). TRAMORE BACKSTRAND (I-WeBS count): Totals included 656 Brent Geese, 102 Mallard, 2 Great Crested Grebes, 26 Little Egrets, 437 Oystercatchers, 2-3000 Golden Plover, 93 Grey Plover, 51 Ringed Plover, 45 Sanderling, 443 Curlew, 340 Black-tailed Godwit, 411 Redshank, 13 Greenshank, 49 Turnstone & a Jack Snipe (full details). Near LISMORE: Buzzard just outside the town, and Crossbills still present in a garden. WATERFORD CITY: Jay, Maypark Lane (by Waterford Regional Hospital). Near DUNGARVAN: Merlin at the Master McGrath monument. Near LISMORE: Crossbills present in garden, and also seen at the Vee woods, on Tipperary border. Near LISMORE: Crossbills again present. BROWNSTOWN HEAD: 200 Skylarks, Chiffchaff & a flock of 40 Choughs. COOLFIN/PORTNASCULLY: 72 Greylag Geese on Kilkenny side of R. Suir (at Portnascully). HELVICK HEAD: 4 male Blackcaps & a Black Redstart. CLONEA/BALLINARD: 15 Great Northern Divers, 10 Choughs & a (late) Clouded Yellow butterfly. 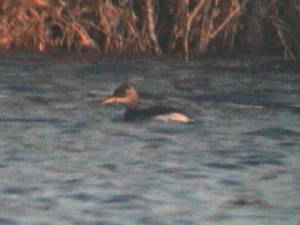 BALLYVOONEY COVE: Male Surf Scoter, 2 Red-throated Divers & a Great Northern Diver. WHITING BAY: Wheatear still present. 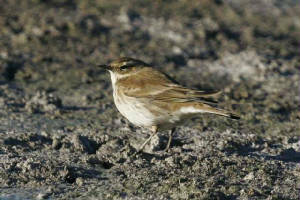 DUNGARVAN: Another late Wheatear, at the Cunnigar. Near LISMORE: 17-20 Crossbills, now feeding on beech-nuts in a garden here. ARDMORE: Black Redstart on beach. RAM HEAD: Glaucous or Iceland Gull today or yesterday. WHITING BAY: A late Wheatear. DUNGARVAN town: *Chimney Swift still present where found last night, just south of the N25-bypass between Fairlane & Kilrush roundabouts (3rd & 4th coming from the west). 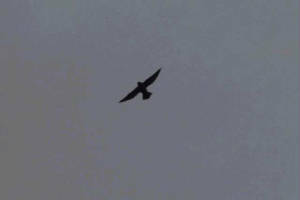 Also a Swallow. 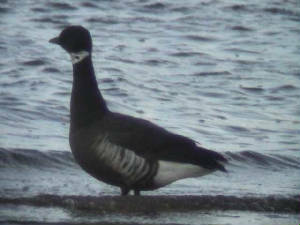 TRAMORE BACKSTRAND: Black Brant still present. 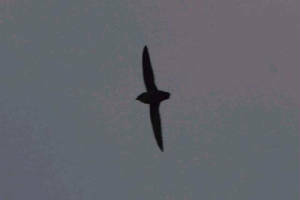 DUNGARVAN town: *Chimney Swift found in late afternoon (1st county record) - this follows an influx of up to 8 birds of this North American species in Co Cork over last few days. 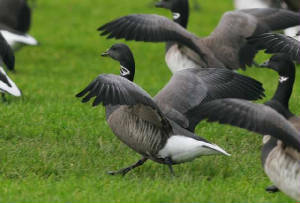 TRAMORE BACKSTRAND: Black Brant ('Pacific' race of Brent Goose) off Saleen. BROWNSTOWN HEAD: Long-eared Owl & 4+ Black Redstarts.